Move over Posh and Becks, because Brooklyn Beckham and his girlfriend Hana Cross are quickly becoming one of our favourite celeb couples. And the pair were looking more loved up than ever yesterday when they attended The Fabulous Fund Fair party in London. Not shy about showing some major PDA, Brooklyn, 19, even sported a ‘H’ necklace, while his model girlfriend wore a matching ‘B’ pendant as a small tribute to her man. Cute, or what? 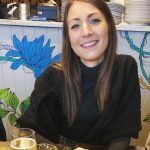 Hana, 21, also stepped out in a lace black blouse beneath an oversized blazer and Brooklyn took style inspo from his dad once again with a tweed flat-cap and beige braces. 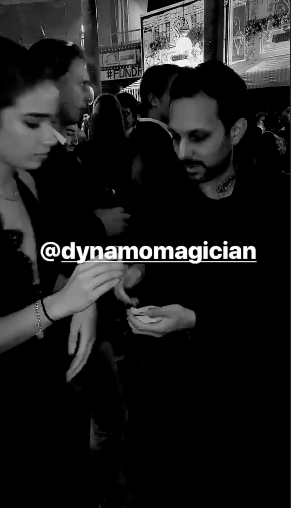 In one video, posted on Brooklyn’s Instagram Stories, famous magician Dynamo showed Hana a card trick. 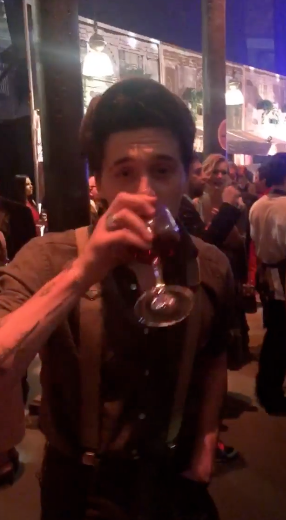 While on the model’s social media page, her boyfriend can be seen dancing the night away with a glass of red wine in his hand. Clearly the pair enjoyed their night out, as Brooklyn later posted a picture cuddling up to Hana in the swanky venue alongside the caption: ‘Amazing night,’ and a love heart. This comes after Hana joined the entire family – including Brooklyn’s siblings Romeo, 16, Cruz, 13, and Harper, seven – on the front row of Victoria’s fashion show on Sunday. Along with football star David, 43, they all then headed to Mark’s Club in Mayfair to celebrate the collection and mark the launch of 44-year-old Vic’s YouTube Fashion & Beauty channel. And in case you missed the amazing pictures, the star-studded bash featured a Spice Girls drag queen tribute act booked to sing to the guests.